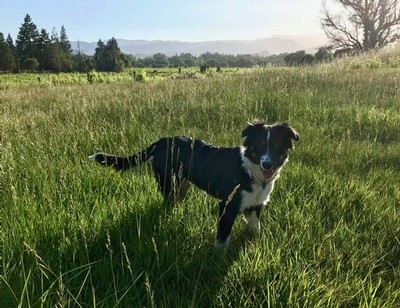 Patland Estate Vineyards - Brix, The Wine Dog! Hello! My name is Brix! I am a six month old Border Collie, or as my parents like to call me, a Bordeaux Collie! I have a lot of energy and frequently enjoy running around large vineyards. My favorite toy is my blue rope, and my favorite treat is peanut butter! I don't get to go to work with my parents every day, but once in a while they take me. It's always so much fun to meet new people. Hopefully I'll get to meet you too!